This is a good time for ophthalmic opticians. 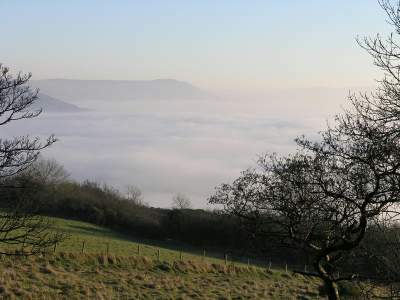 Every morning great big banks of fog come drifting in from the Atlantic. The valley fills up with the stuff and soon the soup is everywhere. Even the usual low flying noisy air traffic has ground to a halt. At the Newsbrowser's offices work has come to a happy standstill. After all, what can you report when you can't see anything that may be happening? To appreciate the extent of the problem readers are invited to examine the photograph. You are looking at an aerial view of the Roe Valley. Come to think of it: If Limavady had a zoo, the only thing you would see at the moment would be the smug little faces of the giraffes admiring the view from just above. Mind you, the people living high on Benevenagh enjoy an even better vista. In these days of ever-rising fuel prices it is heart warming to know that there are some people out there who really care! Take Costcutters for instance who seem to have decided to live up to their name in a big way. 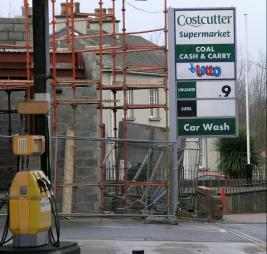 0.9 of a penny for a litre of unleaded petrol really is a very decent price and should ensure queues of customers from Derry to Coleraine once the word spreads. The range - it must be said - is slightly limited and it is not clear whether they have run out of diesel or if they are giving the stuff away for free. But then - at these prices, who cares? 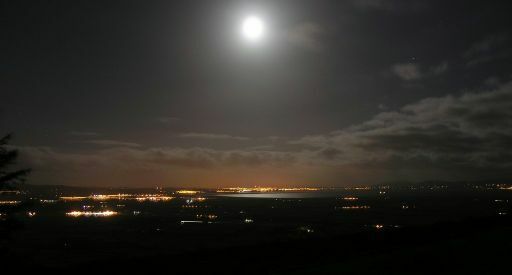 We know that many of our readers like a good view - so here is the moon over Lough Foyle. The photograph was taken at six in the morning on a cold windy day from near the top of Benevenagh looking towards Derry. This job is getting harder by the day!